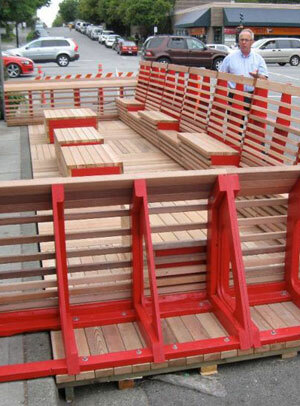 One brand new parklet, Parallel Park, which cost just $18,000, features a new deck-like structure in place of two parking spots and includes built-in seats and wood-cubed tables. 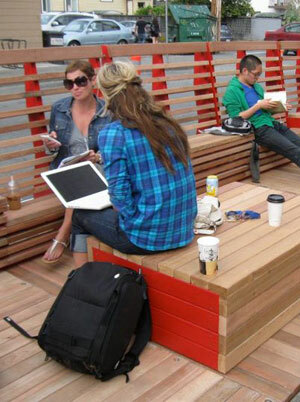 Designed by Travis Martin, Associate ASLA, currently employed with landscape architecture firm van der Zalm + Associates, this pocket public space is made of clear cedar. According to The New York Times, turning underused transportation infrastructure into new public spaces isn’t just happening at the small scale either. With the success of the second phase of The High Line park (see earlier post), cities like Chicago, Philadelphia, Atlanta, and St. Louis are also now looking at how to reuse their own abandoned railways. Learn more about the projects in Viva Vancouver and see more photos. Explore San Francisco’s Pavement to Parks initiative, which recently expanded. Also, see a Google Sketchup animation focused on how to transform transportation infrastructure into public spaces. I like these much better than the dumpster plantings. 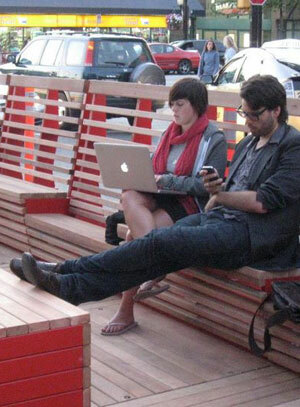 It looks portable too. A boon in bad weather cities.